When a consumer contacts me through the Slowflowers.com site, I pledge to fulfill the order with locally-grown, seasonal flowers. If I am unable to do this (mostly this situation will occur in the winter), I commit to sourcing domestic, American-grown flowers, foliage or plants. 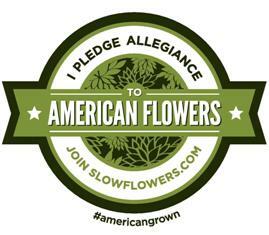 Whenever possible, I pledge to clearly label or disclose to the customer the source of the floral elements I use. If I am unable to fulfill the order for local or domestic flowers, I will tell the customer and whenever possible, I will refer the customer to an alternate resource from Slowflowers.com.